During the wet season, male granular poison frogs (which are very toxic as a way to defend against predators) inhabit lowland humid forests with fast-flowing streams, vocalizing incessantly. Ranging from Costa Rica to Panama, this frog behaves rather aggressively, especially during the wet season, the time of year when males divide stream banks into their “territories” so as to court female poison frogs. The frogs use the territories as calling sites, in addition to places to lay eggs. The male frogs unvaryingly defend these areas from other males, competing over choice females. Experimental studies in Costa Rica suggest that the male granular poison frog spends the majority of its time and energy defending its calling site. And the data from these studies also show that these warning signals are more vocal (acoustic) than visual. But you can be sure that these calls differ somewhat from those used to attract females! If an encroaching male granular poison frog were to dare approach too closely, these frogs have no qualms about engaging physically. The lengths they will go to defend their territory epitomize their unique aggressive behavior. Although adaptable to habitat destruction, fragmentation, and human encroachment, these frogs seem to prefer primary forests, and their population numbers are declining. Studies indicate that granular poison frog densities are highest on stream banks in primary forests. But no matter how many males lay claim to a particular mountain stream, you can be sure that even though territory sizes may have increased in these cases of lowered density, these cute frogs will not suddenly become amicable or even tolerant of males that come too close! 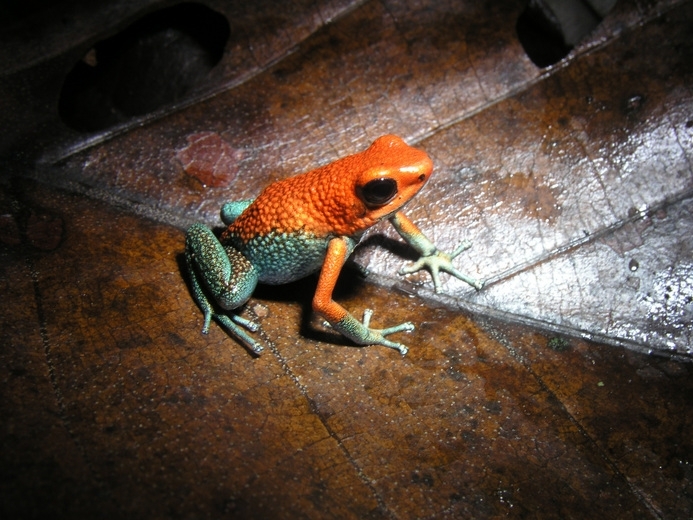 This entry was posted in biodiversity, Cute Frog of the Week, why frogs matter and tagged Cute Frog of the Week, Dendrobates granuliferus, Granular Poison Dart Frog by Lindsay. Bookmark the permalink.